Michael O'Leary built the airline by cutting costs at every opportunity, but a new strategy is paying off. Ryanair has become synonymous with a cultish devotion to cutting costs. Charges for using the toilets and new standing-only tickets never materialised, but what they did is help cement the idea that if you need a seriously cheap flight then Ryanair is the first place to look. It paid off initially and the airline has grown substantially in it years under chief executive Michael O’Leary, but earlier this year it posted its first quarterly loss in three years. Clearly it needed a rethink. That’s why in March O’Leary revealed that Ryanair would be taking a more touchy feely approach. The airline has since launched a ‘business class’ service (think hold baggage allowance rather than flat bed seats), improved services for families and a more intuitive website to replace its previous 90s throwback. You could argue this is the same old Ryanair in new packagaing, but it seems to have paid off. Today the airline announced that profits were up 32%, revenues were up 9% and passenger numbers were up 4% in the first half of this year. ‘While partially due to the presence of Easter in Q1 and a weak prior year comparable, we have also enjoyed a strong summer thanks to our strategy of raising forward bookings and improving our customer experience which has delivered higher load factors and yields,’ O’Leary said. He's certainly reigned in his CEO speak of late. Back in 2012 he defended the gap between his and his employees' level of pay, telling MT, 'I think the gap should be wider. I probably work about 50 times harder.' He pledged to step back from the spotlight last year and while he's not exactly disappeared, he's certainly stopped swearing so much. 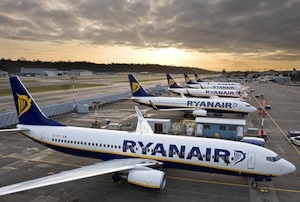 The airline said it now expects passenger numbers to grow 15% in the next six months and full year profits to be between €750m-€770m (£586m-£600m), much higher than the €650 previously indicated. If the success continues, who knows - perhaps we will be seeing three course meals and a free choice of seating some time soon. Gatwick hits back at Heathrow - devastating blow or too little, too late?